December 5, 2011: 3D fileSpace 1.1 available! Buy now | Download v1.0 (256 KB). For Mac OS X 10.2 or later. Free trial, $19 single license. Run powerful Unix tools with point-and-click ease. Quickly see what each tool does and which options are available. Skip the manual and have correct command lines built for you. In the example above, the popular Unix tool grep has been set to search Mail.app's mailboxes for occurences of 'lettuce' followed by 'tomato'. Many, many search options are available and since grep is both powerful and fast, all the matches will be listed in a matter of seconds. The setup shown for the Mac OS X defaults tool will cause all the current preferences for Safari to be listed. With a few clicks you could then make Safari re-import bookmarks, even though it normally only does this once. Developers will appreciate being able to interact with nibtool through a graphical interface, especially when it helps them avoid localization headaches. It's a fact that the command line's ease-of-use leaves much to be desired. But the tools it offers are both powerful and flexible, and for some tasks the best choice--or the only choice--is to enter commands in the Terminal. With Aqua Command-Line Tools, the layout of each tool's graphical interface makes it easy to quickly find and activate just the features you want. You don't have to remember obscure commands or spend valuable time wading through dreary manuals, your command-lines are built for you. Click a few checkboxes, drag and drop files and folders to specify options and parameters, and your command line is ready to be executed in the Terminal. Terminates a process, or sends it a signal. Searches files for a given pattern. Reverses characters in each line. Splits a file into pieces. Displays first lines of a file. Displays last part of a file. "Pipe fitting", all-purpose input copier. Word, line and byte count. Moves files and folders, and/or renames them. Changes the shell's directory, stacking the current one. Changes the shell's directory back to the last one stacked. Shows the path to the current working directory. Localizes, lists or updates nib files. Scans source code to generate localizable .strings files. The next few versions will be adding support for most of the following 100+ tools: split, uniq, hexdump, jot, cut, paste, less, tr, sort, cmp, expand, tsort, unvis, vis, cat, date, comm, merge, diff, diff3, rs, find, ls, locate, touch, file, mkdir, cp, df, chmod, chown, chflags, chgrp, fs_usage, cksum, md5, quota, top, sudo, su, leaks, leave, uptime, who, rwho, w, id, ac, lastcomm, uname, tty, man, fstat, malloc_history, ruptime, time, tops, mailstats, netstat, periodic, SetFile, GetFileInfo, lipo, gdb, MvMac, CpMac, ditto, otool, open, redo_prebinding, update_prebinding, strings, pagestuff, libtool, mount_hfs, cmpdylib, lsbom, mkbom, sample, sc_usage, segedit, size, strip, vm_stat, vmmap, bless, asr, ioreg, installer, kextstat, kextload, kextunload, lsof, pstat, Rez, DeRez, sdp, whois, curl, rcp, nfsstat, ndp, tcpdump, uuencode, pax, ar, gzip, tar, compress. After registering, you'll receive an email with your license code, titled "Thanks for your purchase". Quit and restart the software, then enter your name and license code in the startup window to complete your registration and unlock all features. ps tool: the -p, -t and -u arguments should appear next to their [Process ID], [Terminal name], [User name] parameters at the end of the command line. Reordering the fields in the pane will fix this. defaults tool: the process pane mistakenly presents the command "read [this key] [in all domains]" as valid. Reordering the radio buttons in the pane will fix this. Adding interfaces for more tools. 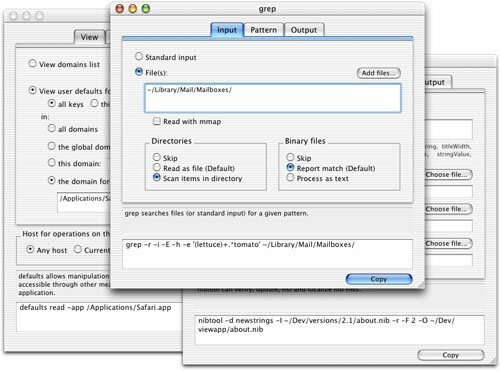 The goal is to do for Mac OS X users what MPW's excellent commando tool did for its users. Deutsch, Español, Français, Italiano, Polish and Japanese versions. Saving of favorite command-lines and the ability to select them from a menu. Finalize the documentation for the IB palette and inspector allowing customization, localization and creation of new tool dialogs.